Pablo Javier Zabaleta Girod (Spanish pronunciation: [ˈpaβlo saβaˈleta]; born 16 January 1985) is an Argentine professional footballer who plays as a right back for Manchester City and the Argentina national team. Zabaleta can operate on both sides of the pitch as a full-back and is known for his tenacious style of play. Zabaleta contests for the Manchester City right-back position with Bacary Sagna. 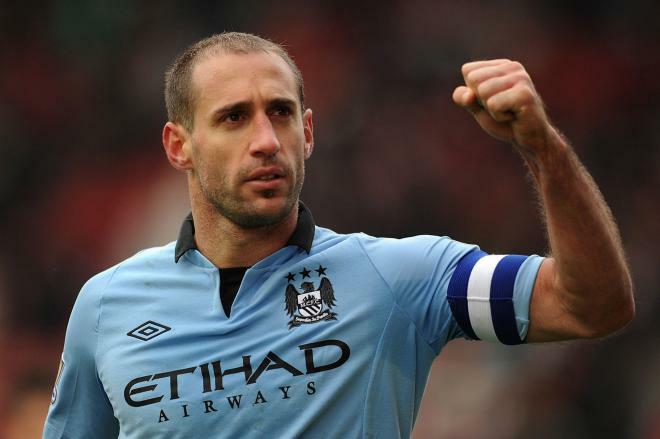 He has captained the side on numerous occasions.With Manchester City, Zabaleta has won all three of English football's major honours: the FA Cup (2011), the Premier League (2012 and 2014), and the Football League Cup (2014). Before joining Manchester City, Zabaleta played for La Liga club RCD Espanyol, where he won the 2005–06 Copa del Rey.A full international since 2005, Zabaleta represented Argentina at the 2011 Copa América and was also in their team which won gold at the 2008 Olympics. 1 Won three titles with Manchester City (ENG): Premier League (2011-12), FA Cup (2010-11) and FA Community Shield (2012). 2 Won the gold medal with Argentina in the 2008 Olympic Games. 3 Won Copa del Rey (2005-06) with RCD Espanyol (SPA). 4 Won Copa Sudamericana (2002) with San Lorenzo de Almagro (ARG). 5 Has played for San Lorenzo (2002-05), RCD Espanyol (2005-08) and Manchester City (2008-Present). 6 South American Youth Championship with Argentine Soccer Team in 2003. 7 He began his soccer career at the age of 17.